Sometimes, you just need to get away. 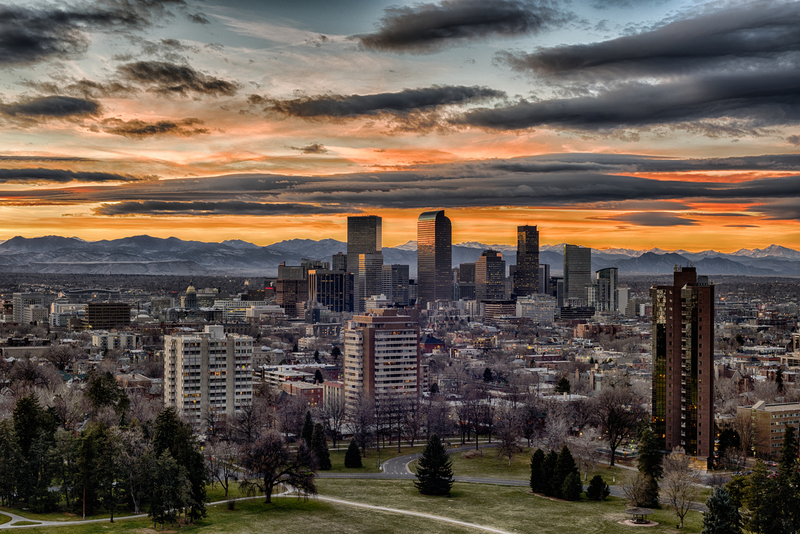 If you're in need of an escape, why not head to Denver? Thanks in part to its breathtaking mountain views, vibrant food scene and proximity to outdoor adventures, the city was named one of the top places to visit in 2018 by the New York Times. If you're looking to explore a Denver destination, head to the Golden Triangle Creative District, near downtown. The up-and-coming arts center has a lot to offer, including world-class museums and galleries. Whether you're trying to jet set ASAP or you're looking to plan your trip around the future's cheapest fares, take a look at these forthcoming flights between San Francisco and Denver, which we pulled from travel site Skyscanner. We've also included top-rated hotels, restaurants, and attractions in Denver, to get you started on planning your ideal get-away. Currently, the cheapest flights between San Francisco and Denver are scheduled to leave on December 1 and return from Colorado on December 4. Frontier Airlines currently has round-trip tickets for $127. Frontier Airlines also has tickets at that price point in January. If you fly out of San Francisco on January 8 and return from Denver on January 12, Frontier can get you there and back for $127 round-trip. To plan your accommodations, here are some of Denver's top-rated hotels, according to Skyscanner. They were selected based on price, proximity to activities, and customer satisfaction. If you're looking to treat yourself, consider The Brown Palace Hotel and Spa. The hotel has a 4.9-star rating out of five on Skyscanner, and rooms are currently available for $169. If you're looking for an inexpensive place to stay, there's the Hyatt Regency Denver at the Colorado Convention Center. Rooms are currently set at $76/night. A pricer alternative is the Four Seasons Hotel Denver. With a rating of 4.8 stars out of five, this luxury hotel has rooms starting at $235/night. Set in the heart of Denver, it's close to the Denver Performing Arts Center, the 16th Street Mall, the United States Mint and the Pepsi Center. If you're looking to snag a bite at one of Denver's many quality eateries, here are two popular culinary destinations from Skyscanner's listings that will help keep you satiated. If you're looking for a local favorite, head to Snooze: An A.M. Eatery, which has an average of 4.7 stars out of 5, with 72 reviews on Skyscanner. "This restaurant is one to write home about. I'm not kidding you," wrote visitor Mikayla. Next, there's Sushi Den, which has been regarded as one of the premiere sushi and Japanese restaurants in the United States since 1985. "Fantastic sushi all the way up here in the Rocky Mountains," wrote Adam. "Great atmosphere, staff and sushi. Also, the drinks are wonderful." Denver is also full of sites to visit and explore. Here are a few popular attractions to round out your trip, again from Skyscanner's listings. The top-rated visitor attraction in Denver, according to Skyscanner, is City Park Jazz. Consider checking out the Denver Museum of Nature and Science -- one of the city's most popular attractions, drawing almost two million visitors a year. There are permanent displays on North American Indians, Egyptian mummies, dinosaurs and minerals, all stunningly detailed and vast. "With great traveling exhibitions, a full-fledged research staff renowned for their groundbreaking work in paleontology and a variety of natural history exhibits unparalleled in a 1,000-mile radius, this museum is not to be missed," wrote visitor Stan.